Exactly one hour before Mayor Rahm Emanuel stepped off to lead the Chicago Pride Parade on June 24th, the Chicago Police Department posted a Facebook message. As of that morning “10 new officers” were joining the 19th (Town Hall) Police District. Town Hall’s coverage area includes the entire parade route and all parts of the city between Lake Michigan, the Chicago River, Fullerton, and Lawrence. Another 90 “new officers” were going to other districts as part of Emanuel’s relentlessly-hyped promise to add 1,000 more cops to the police force by the end of this year. Despite adding “10 new officers” to the district on June 24, Town Hall has actually lost six more officers, according to the latest manpower numbers from CPD. That follows a loss of 13 officers the month before. 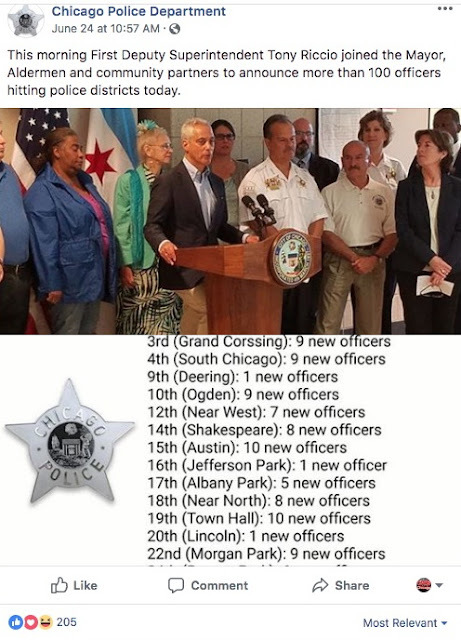 But the numbers are sliding and, with 366 cops, Town Hall now has 102 fewer officers than it did when Emanuel formed the district by merging two smaller units in a cost-cutting move. In late 2011, citizens were promised the merger would produce “more cops on the street” and the police superintendent at the time, Garry McCarthy, committed to keeping manpower in place. Police Superintendent Eddie Johnson “expressed his disappointment in current staffing and remains committed to getting and keeping police officers in the 19th District,” Tunney added. How strange. The alderman is “disappointed.” The superintendent who promised to get manpower back to pre-merger levels is “disappointed.” Yet nothing is done. Now that, gentlemen, is disappointing. In his email, Tunney asked constituents to send emails and phone calls to Emanuel and Johnson. But Tunney's been redirecting complaints to them for nearly a year. We politely suggest that you not waste your time with Emanuel or Johnson. If they were going to listen to constituents, that would have been done by now. Instead, direct your thoughts to Alderman Tom Tunney. And, if the district's manpower is not to your liking by February, vote accordingly.